The internet is a powerful tool when it comes to promoting your business, and it’s incredibly easy to utilise it to its full potential. It’s a great way of increasing your company’s reach as well as making customers aware of the goods and services you supply. One way to use the internet to make customers more aware of your products is with a well-designed brochure website. But what exactly is a brochure website, and how can you get one for your business? Below we shall explain everything you need to know about brochure websites, from a basic definition to the benefits of a brochure site, where you can acquire one and how much it will cost. Simply put, a brochure website is a digital version of a printed brochure. They show the products or services your company provides, however, unlike an e-commerce website, they do not sell the product or service online. With a brochure website, the goods and services are only displayed, so customers will have to contact the company to place an order. Brochure websites tend to be visually engaging, and the best brochure sites make the most of search engine optimisation to really get the noticed in search results. These websites can be accessed on desktops, smartphones, and tablets through any browser, so you can be sure your company is reaching the maximum number of people. A well-made brochure website is great for promoting your business. Using effective words and captivating images, they can draw people in and really sell your products. If you think your company or business would benefit more from an e-commerce website, where you would be able to both display goods and services, and allow customers to make purchases through the website, so visit our e-commerce website page. Why go for a brochure website? The main demographic for brochure websites are small businesses with a limited budget who rarely need to make changes to their website so are cheaper to build and cheaper to maintain. Brochure websites also have a pretty long shelf-life (if built right from the outset) and don’t have to be updated very often, unlike an e-commerce website which has to be kept up date with stock and new product features. So, if your business fits this criteria, you may be wondering about the benefits of brochure websites. As obvious as it sounds, most companies will use a brochure website to show that they exist. By having an online presence, your business will be able to reach a broader number of people and inform them about the services you offer. If your brochure website is professional, it will also tell potential customers that you’re serious about what you do. Brochure websites are also great if you don’t want to have to spend too much time updating and managing a website. By simply designing a brochure website, you can leave it up on the internet and only update it as and when your services or prices change. This way, you can get on with work that really matters to you. However, being specialists in SEO we would still encourage you to keep your brochure site fresh and up-to-date as much as you can to keep Google ranking your site high in its search results and maximise your web traffic potential. They’re also great if you don’t want to spend too much money on your company’s website either. As they’re much simpler, and require a lot less maintenance, meaning that brochure websites can bring an excellent ROI, despite not directly selling any products to customers. What does a brochure website look like? Below are a couple of examples of a brochure website, to give you a better understanding of how one of these types of sites would work and what it would look like. 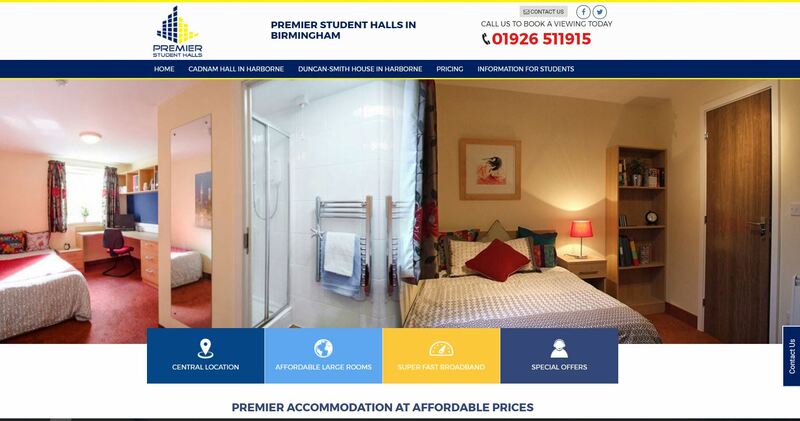 As you can see, the contact details on the Premier Student Halls website are prominent, so you easily know how to contact the company and place an order, or, in this case, book a viewing to one of their student halls in Birmingham. Take our client Warefence as another example. As well as the brand and product being the primary visual focus, showing accreditations, certifications and association memberships is a key factor to demonstrate that they are a professional and trustworthy supplier. 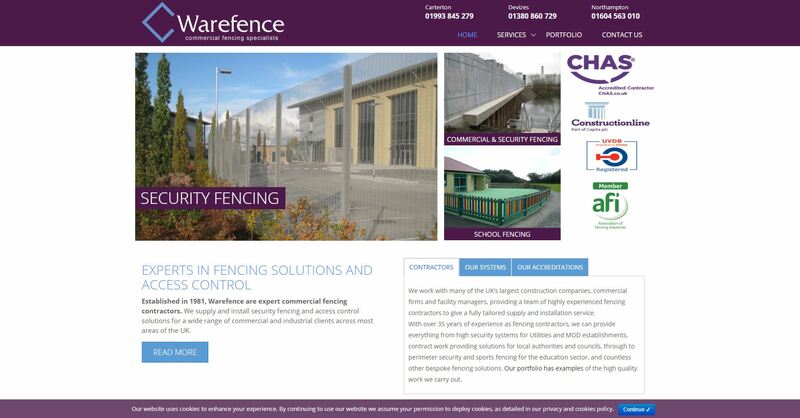 Since fencing varies greatly in pricing, depending on the job, the aim is to get users to get in touch so that they can be given a tailored quote. That’s why these brochure sites focus less on price and more on the product offered, giving information rather than offering an option to buy now, since this would make the site an e-commerce website. For Saturn Interiors, the focus is on showcasing their kitchen installations. This visual approach not only helps build up trust with the customer, since they can see the sorts of results they will get with this kitchen fitter, but it helps build up desire for the end product. Having a well maintained gallery also contributes to encouraging user interest and engagement, with the aim of pushing potential customers towards the contact page. Found this article interesting? Or want to find out more about the website designs we can do for you? Visit our web design page or get in touch with our team today!